There are two occasions in the Old Testament of Moses smiting a rock to provide water for the despairing Israelites in the wilderness. Let us examine the events, their differences, and the lessons to be learned. In this account Moses, in the name of God, smote a rock in Horeb with his rod to release water for the thirsty Israelites who had camped at Rephidim (see map below), about 1 1/2 months after the Exodus (compare Exodus 19:1). From this rock gushed water, abundantly refreshing Israel. “(1) And all the congregation of the children of Israel journeyed from the wilderness of Sin, after their journeys, according to the commandment of the LORD, and pitched in Rephidim: and there was no water for the people to drink. (2) Wherefore the people did chide with Moses, and said, Give us water that we may drink. And Moses said unto them, Why chide ye with me? wherefore do ye tempt the LORD? (3) And the people thirsted there for water; and the people murmured against Moses, and said, Wherefore is this that thou hast brought us up out of Egypt, to kill us and our children and our cattle with thirst? (4) And Moses cried unto the LORD, saying, What shall I do unto this people? they be almost ready to stone me. (5) And the LORD said unto Moses, Go on before the people, and take with thee of the elders of Israel; and thy rod, wherewith thou smotest the river, take in thine hand, and go. (6) Behold, I will stand before thee there upon the rock in Horeb; and thou shalt smite the rock, and there shall come water out of it, that the people may drink. And Moses did so in the sight of the elders of Israel. The second occasion of Moses smiting a rock for water occurred much later, near the end of the 40 years of wilderness wandering. This is recorded in the fourth book of Moses, the book of Numbers, chapter 20. Here Moses and Aaron “rebelled against my word” (verse 24). For on this occasion God told Moses to speak to the rock, but in anger, and failing to credit God for caring for the Israelites, Moses asked the crowd “must we fetch you water out of this rock?,” and smote it twice. “(1) Then came the children of Israel, even the whole congregation, into the desert of Zin in the first month: and the people abode in Kadesh; and Miriam died there, and was buried there. (2) And there was no water for the congregation: and they gathered themselves together against Moses and against Aaron. (3) And the people chode with Moses, and spake, saying, Would God that we had died when our brethren died before the Lord! (4) And why have ye brought up the congregation of the Lord into this wilderness, that we and our cattle should die there? (5) And wherefore have ye made us to come up out of Egypt, to bring us in unto this evil place? it is no place of seed, or of figs, or of vines, or of pomegranates; neither is there any water to drink. (6) And Moses and Aaron went from the presence of the assembly unto the door of the tabernacle of the congregation, and they fell upon their faces: and the glory of the Lord appeared unto them. (8) Take the rod, and gather thou the assembly together, thou, and Aaron thy brother, and speak ye unto the rock before their eyes; and it shall give forth his water, and thou shalt bring forth to them water out of the rock: so thou shalt give the congregation and their beasts drink. (9) And Moses took the rod from before the Lord, as he commanded him. (10) And Moses and Aaron gathered the congregation together before the rock, and he said unto them, Hear now, ye rebels; must we fetch you water out of this rock? (11) And Moses lifted up his hand, and with his rod he smote the rock twice: and the water came out abundantly, and the congregation drank, and their beasts also. (12) And the Lord spake unto Moses and Aaron, Because ye believed me not, to sanctify me in the eyes of the children of Israel, therefore ye shall not bring this congregation into the land which I have given them. (13) This is the water of Meribah; because the children of Israel strove with the Lord, and he was sanctified in them. One of the reasons why Moses was not permitted to lead Israel into the land of promise concerns this second occasion. Smiting the rock on the first occasion (Exodus. 17:1‑7) was by God’s direction, and the waters gushed forth. But the second time (Numbers 20:2‑12) the Lord said to Moses, “Speak unto the rock,” but instead he hit the rock with his rod twice. Moses’ sin in the Numbers account was self‑assertion and lack of faith (R4047:6, R5315:5). In Numbers 27:14, God clearly states to Moses that He punished Aaron and him for their disobedience. “For ye rebelled against my commandment in the desert of Zin, in the strife of the congregation, to sanctify me at the water before their eyes: that is the water of Meribah in Kadesh in the wilderness of Zin” (Numbers 27:14). By not saying that God would provide them water, saying rather that they would give the whole community water, Moses and Aaron had disobeyed God. As Moses and Aaron were punished for their wrong actions, so too, God’s people may have to live with the consequences of their poor decisions or impulsive actions. However, God still provides access to the the waters of spiritual life. God knows that no one could stand before God if every mistake were recorded and not forgiven. “(3) If you, O LORD, should mark iniquities, O Lord, who could stand? (4) But with you there is forgiveness, that you may be feared. (5) I wait for the LORD, my soul waits, and in his word I hope; (6) my soul waits for the Lord more than watchmen for the morning, more than watchmen for the morning. (7) O Israel, hope in the LORD! For with the LORD there is steadfast love, and with him is plentiful redemption” (Psalm 130:3‑7, ESV). Some time later, God led Moses up to Mount Pisgah’s top (Numbers 27:12), with an extended panoramic view of the Promised Land of Canaan. Moses saw this with his natural eyes, but Moses saw much more through the eye of faith, seeing the promises which God had made to the tribes of Israel through Abraham, Isaac, and Jacob. “We hear not a murmur respecting the transfer of leadership and the cessation of his own labors. If God had used Moses in his service to the extent that he was pleased to do, the servant was thankful and satisfied” (R3077). “The most unjust thing we can do is judge Moses or any other man by his deeds and not by his fruits” (R4055:5). “Christ Jesus, the true Rock, was to be smitten but once for our sins, and as a result of that one smiting at Calvary [i.e. Christ’s death, which made possible the access to God’s grace in Christ to those God has called out of the world] the water of life would be obtained for all true Israelites to all time; and if for a season the flow was stopped it was only necessary that the Rock should be invoked in the name of the Lord, that the waters might again flow forth. Christ dieth no more; death has no dominion over him; therefore in the type the Rock should not have been smitten a second time. But the second smiting, nevertheless, made a new type, because as the Apostle explains, there are some now who crucify Christ afresh, and put him to an open shame‑some of his professed followers denying or ignoring the value of the original sacrifice, denying the blood that bought them, are counted as committing the sin unto death — Second Death — and of these Moses became a type, and as a type of a class which would have to do with the antitype of the rock, he was debarred from Canaan — Hebrews 6:4‑6” (R3077). “Any denial of the Redeemer on the part of the consecrated would signify a crucifying afresh, a smiting of the rock a second time” (R5315:4). “We might remark here, too, that those who smote the Lord the first time, at Calvary, have the promise of full forgiveness. They shall look upon him whom they pierced, and shall mourn for him, and the Lord will pour out upon them the spirit of prayer and supplication, and they shall have full opportunity of recompense and reconciliation (Zechariah 12:10). It is those who, with greater knowledge, and after they have become partakers of the holy Spirit, and have tasted the good Word of God, and the powers of the age to come, sin wilfully and count the blood of the covenant a common thing [unholy thing, Hebrews 10:29] — these are they who commit the real sin unto death, and for whom the Scriptures suggest no hope, or further opportunity, because they have sinned wilfully” (R3077). What if Moses Had Not Smitten the Rock in the Numbers Account? If Moses had not smitten the rock in the Numbers 20 account, would he have been permitted to enter the promised land? Br. Charles Taze Russell answers this question in R3077. Here are some differences and similarities noted between the Exodus and Numbers account concerning the smiting of the rock by Moses. (1) Time — The first account occurred in the opening year of the Exodus while the other occurred near the opening of the 40th year after the Exodus. The Exodus account was in the second month of the first year, while the Numbers account was in the 1st month of the (last) 40th year of travelling. (2) Location — Exodus account: in the Wilderness of Sin at Rephidim (Exodus 17:1); Numbers account: in the desert of Zin at Kadesh, in the first month of year 40 of their travels. (3) Moses’ attitude — On the first occasion, Moses followed God’s instructions to the fullest and his attitude was noble and honorable, while in the closing account his attitude was angry and personal, rather than deferential: “Must we fetch you water?” were his words, rather than giving glory to God by saying something like “God will give you water,” and meekly directing the attention to Jehovah. (4) Level of Obedience — In the opening account Moses hit the rock once as God told him to do, while in the closing account he was to speak to the rock but he disobeyed and instead hit the rock twice. (5) The Rods — the rod in the Exodus account was Moses’ rod, while the rod in the Numbers account may have been the rod of Aaron. (Numbers 20:9, “Moses took the rod from before Jehovah” — perhaps the rod of Aaron that had been “before the testimony,” Numbers 17:10). (6) Who was present — In the Exodus account Moses struck the rod in the sight of the Elders, while in the Numbers account, the whole assembly of the Israelites was present. (7) All the Israelites still murmured and quarrelled during the 40 year wandering in the wilderness. Thus the only ones to enter the Promised Land of Canaan were Joshua, Caleb, and all the children of the Israelites who were less than 20 years of age (Numbers 14:20‑30). (8) The Rock — in both cases the rock represents Christ, the Rock of Ages. “And all drank the same spiritual drink. For they drank from the spiritual Rock that followed them, and the Rock was Christ” (1 Corinthians 10:4). (9) In both cases, the waters quenched the thirst of the Israelites. (10) Two examples of the spiritual Rock are given during the life of Moses to show that there are two time periods in history during which the spiritual waters of life do flow — first for the Church class during this Gospel Age (from Pentecost in 33 AD) and next, in the kingdom age, for the world of mankind. In the Exodus account it was thus necessary for Christ to be smitten once: Romans 5:8, 1 Peter 3:18, John 7:32, 37. Before anyone can come unto Christ, he must thirst for the Truth. He must first have and show an appreciation of all that the Heavenly Father has to give. The waters beautifully picture the waters of eternal life that the Heavenly Father offers to those who have faith in Him, and the blessings that will flow through Him. The flowing waters satisfy the hearts of the Church class during the Gospel Age. These are pictured in the Elders in the Exodus account who were present with Moses. This water becomes a well spring of Truth in each one of us, with an opportunity to nourish others along the way. (11) The Church’s sojourn began at the beginning of the Gospel Age, just as the Exodus account comes at the beginning of Israel’s wanderings in the wilderness. In Revelation 22:1 we read, “Then the angel showed me the river of the water of life, bright as crystal, flowing from the throne of God and of the Lamb.” Mankind will only receive that life‑giving water after the Kingdom is ushered in, just like in the Numbers account it comes at the end of the wilderness wanderings when the Gospel Age is complete. Then the resurrected world of mankind will receive the benefits of the Kingdom when they are ready to enter into the Promised Land, but on the earthly plane of existence. (12) Christ will not then be smitten a second time. As pictured in the Numbers account, God will speak to Jesus at the appropriate time and the waters will not simply come forth, but they will come forth abundantly, as we are told in Numbers 20:11. Then the waters of life will be given to refresh all the people. (13) The spiritual walk that we have entered into began with Christ. After crossing the Red Sea, the waters of Marah were bitter, representing the prevalence of sin throughout the world. Christ came to Jordan and offered his life and the first glimpse of the sweetened waters were given there. Next, at Elim, there were 70 palm trees and 12 wells. This relates to when our Lord sent out 70 into Galilee to preach the Gospel and he sent out 12 Apostles as the “wells” of spiritual Truth. Our Lord said he was “the true bread from heaven.” Yet the Israelites did not want that, but the quail. At Sinai, the tables of the Law were written into their hearts. Some have gone through difficult experiences like Miriam who was struck with Leprosy for 7 days, and some come back with a bad report and think it’s too much of a cost to bear, being consecrated to God. But those who endure with faith receive God’s blessings. In Numbers 21:6 the fiery serpents represent the affliction of sin, which the world can be relieved of by looking to Christ for their healing (Numbers 21:8). Not just to seek and ask God for answers and direction in our situations of daily life, but above all, in doing so, to give God the glory in all that we say and do, and in any way the Heavenly Father permits, allow for the “hearers” as well as ourselves to recognize God’s influence in each matter. That is, see the presence of Christ through the actions, words and doings of the person(s) each does associate with in the experiences of this present life. Here is an example of a lesson to learn from Moses’ smiting the rock twice, in today’s world. If we give someone either financial or material gifts, then we should not think it is because of our power or our ability, but rather see that it is because of our Almighty Heavenly Father’s help — His love, justice, power, and wisdom working in harmony through His children called by Him, to do works that reflect Christ-likeness. We should do works in a way so as to fulfil God’s will and God’s purpose through us whom He has called to be partakers of the Heavenly calling now during the Gospel Age, from Pentecost forward. St. Paul, by inspiration, points out to us that that rock represented Christ, that the smiting of the rock represented putting Christ to a shameful death, and that only by this means is the Water of Life provided for the people of God. As the waters of that rock followed the Israelites, so the stream of God’s favor, through the sacrifice of Christ, refreshes Christ’s disciples throughout their wilderness journey. Refreshed in body and in faith, Israel journeyed onward, but encountered new obstacles. The Amalekites, a warlike people, considered the coming of Israel as an invasion of their country, and attacked them in battle. A people used to peaceful pursuits, as the Israelites had for centuries been, would naturally be at a disadvantage in a conflict with such opponents. Yet God gave them the victory. He indicated, however, that it was not by their prowess or skill, but of His grace that they conquered. Moses, stationed upon a high hill, lifted up his hands in prayer to God for the people. While he did so, success was theirs; but when he ceased thus to pray, the Amalekites were the victors. Perceiving this, Aaron and Hur assisted in holding up the hands of Moses until the battle terminated with success for Israel. God thus indicated that Moses was the advocate or representative of Israel, and that without him they could do nothing. By having close communion with God through unceasing prayers, God’s people can seek the Heavenly Father’s direction and counsel in all of life’s affairs. Such complete dependency on God may by God’s grace and mercy result in a mind that desires and does only the will of God, which in turn, can result in glory, honour, and praise to our Heavenly Father through Christ. Moses was the “meekest man in all the earth” (Numbers 12:3). Perhaps this is one reason that this experience of Moses is recorded for our benefit — to alert us, that no matter our development of humility and meekness, we need to be careful lest a moment of self-assurance, or spiritual pride, does not cause us to forget our proper reliance upon, and respect for, our Heavenly Father. “For the comfort of those who may feel that they have done much worse than Moses, or been much more self‑assertive, been much less careful to honor the Lord, have manifested much more spiritual pride‑for their comfort let us notice that the punishment here was severe because it was part of a type” (R5957). “When one attends a testimony meeting, or a Berean class, and hears no real good testimony but his own, hears no proper answer except his own to any of the questions, never sees an Elder in the chair who knows how to lead a meeting anyway — these should be considered dangerous symptoms of spiritual pride” (R5956). “The proper attitude, as all will agree, is that the Lord’s people should feel greatly humbled instead of greatly exalted and heady in respect to these opportunities for telling the Truth to others” (R5956). “We should feel our unworthiness. We should realize that the Plan is not ours; that we have merely heard of it ourselves; that it is really God’s Plan; that we are honored as His servants to tell it out” (R5956). “But if we allow any impression to go out that it is by any wisdom on our part, or any skill, that the beauty is seen in the Message, then to that extent we are taking glory to ourselves which belongs to the Lord, and doing injury to ourselves proportionately by failing to demonstrate our worthiness to be used by the Lord in the present and in the future. The wonderful privilege of speaking as ambassadors for the Lord, to tell of His greatness and Plan should humble us with the thought that He has privileged us, whereas He has angels, who excel in strength and whom He might have used in communicating this most wonderful Message” (R5956). We should not feel offended if we are not elected as a deacon or Elder or assistant in the Lord’s service. Br. Russell writes that “in all meekness and humility they should feel a timidity even about taking a position where there would be such a responsibility. The admonition on this is that although all of the Church should, according to their knowledge of the Truth, be qualified to be teachers, nevertheless the safer place is not to be a teacher, knowing that such shall have the severer trial. Only a sense of responsibility to the Lord and to the brethren should make one willing to serve in such capacity, much as all ought to love to be the Lord’s representatives in the Church” (R5956). “Let us not forget that while we are to exercise great leniency in viewing the words and deeds of others, ascribing only good intentions where they are professed, we are to scrutinize with all of our might our own hearts, our own intentions. We are to inquire why we did this thing or left undone the other thing; why we did this thing this way; why we spoke in such a tone, etc. Such a careful examination, weighing of thoughts, words and deeds, would be very unsatisfactory to a person who was not wishing to be in accord with the Lord. But those who have made a covenant with the Lord and are faithful to that covenant will find such a course to be a great blessing, comforting their hearts at the time, strengthening them for the future, and in connection with the Lord’s providences it will be fitting and preparing them for places in the Heavenly Kingdom” (R5958). By relying on and asking the Heavenly Father through Christ to show us His way and do it, we can help keep the spiritual armour of Christ on 24/7 to protect us against sinning in a sudden moment that can creep up unexpectedly. Let us remember Moses’ situation and ask God to protect us from it happening to us, and trust that God is able to do more than we even ask for or imagine if He chooses to (Ephesians 3:20). “To Him be glory in the church and in Christ Jesus throughout all generations, forever and ever. Amen” (Ephesians 3:21, ESV). Br. 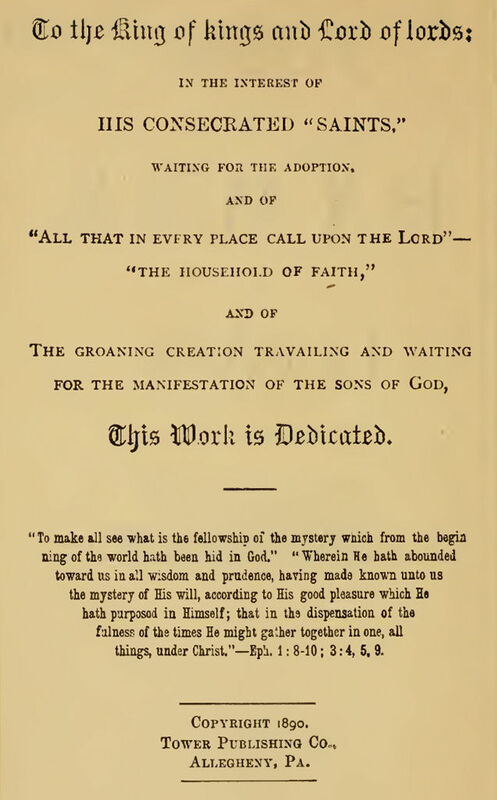 Charles Russell — Reprints of the Original Watch Tower and Herald of Christ’s Presence: R2299, R3077, R4047, R4055, R5285, R5315, R5955.